This carpet was first showcased in one of the most important exhibitions of Art history in Paris 1878 where it was called a “Baghdad” carpet and bought by Vincent Robinson of London who sold it to Baron Adolph Thiem of Berlin who in turn sold it to Charles Tyson Yerkes in 1896. 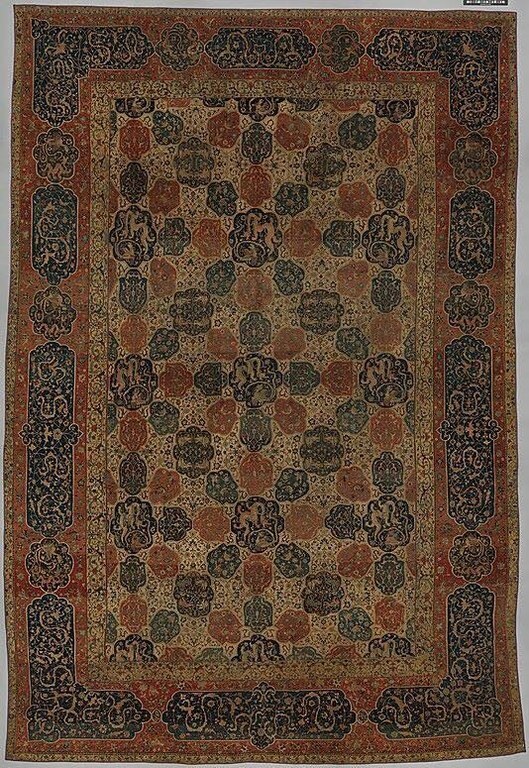 In 1910, 5 years after his death , it was bought by the MET still called a “Baghdad” carpet, but later renamed to a carpet from Iran, for unknown reasons. Another interesting fact about this particular carpet is that it was cut into two halves at some point for unknown reasons, and later a weaver rewove the missing halves onto each carpet, creating two carpets from the one. 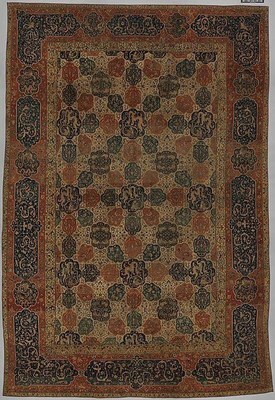 The one “rewoven” carpet is this one and the other “rewoven” carpet is in a museum in Lyon, France. As if the above renaming and reweaving is not enough, I was hugely excited to find this carpet and its original attribution to Baghdad, because it always puzzled me why no Baghdad carpets are in museums around the world. Since the time that the Persian king, Cyrus of the Achaemenid Empire, conquered Mesopotamia all of current day Iraq formed part of Persian territories and the capital of the Sassanid Dynasty 500 years later was Ctesiphon, located in current day Iraq, a mere 35 kilometers southeast of Baghdad and considering the massive contribution the Sassanid Empire made to Persian art, it is a given that carpets were woven in the territories of the “old” Mesopotamia. King Cyrus had a tapestry woven in Mesopotamia hanging on one wall of his tomb and it is quite possible that the infamous Sassanid Baharestan carpet,taken as spoils by the Arab invaders in the 7th century AD, was also woven here. The “Iraq” territories remained part of Persia (throughout all invasions) until it was finely taken by the Ottomans. How is it possible that after the fall of the Ottoman Empire and the emergence of all the carpets from the Topkapi Palace and elsewhere, that nearly none were attributed to Baghdad or surrounds?